CNN seems to be the latest major US media outlet to shoot itself in the foot, allowing a desire to report a ‘gotcha’ story about Trump-Russia collusion to trample the actual facts. It thereby joins a respectable pool of journalistic self-injury victims. The news channel’s latest take on Russiagate targeted WikiLeaks, a whistleblower site that – according to the US media consensus – is nothing more than a not-so-secret arm of Russian intelligence. The story claimed that the Trump campaign was given access to a batch of files stolen from the DNC days before their public release last year. Based on an email sent to the campaign, which CNN never saw, the Friday story had several hours of fame before receiving a headshot from the Washington Post. The email, which the newspaper had obtained, was dated September 14, not September 4 as CNN had claimed. In other words, the day after the documents went public. The latest CNN blunder is reminiscent of how RT was accused by some journalists of being in cahoots with WikiLeaks after the channel reported a release of leaked documents belonging to John Podesta before WikiLeaks own Twitter account did so (but after the batch was published on the site, which the accusers failed to notice). To paraphrase the saying, never let the facts get in the way of a good scoop on Russia. There seem to be plenty of outlets out there sticking to that principle this year. A week before CNN, ABC News failed to get its timing of events right in its Russiagate coverage. Senior investigative journalist Brian Ross claimed that Michael Flynn, a senior figure in the Trump campaign and short-lived National Security Adviser in his administration, was prepared to testify about communications between Trump the candidate and the Russian government. In fact, court documents show that Flynn had been asked to speak with the Russian ambassador by somebody at the top of President-elect Trump’s transition team, and not during the presidential race. Ross was barred from reporting about Trump after the gaffe. One may wonder why the American media are willing to relax their rules for fact-checking and other standard journalistic procedures when reporting on Russia. One may wonder also why they are so reluctant to admit being in the wrong when caught. For instance, it took AP months to finally admit that the much-repeated claim that all 17 US Intelligence agencies agreed that Russia had interfered with the 2016 election was erroneous. The New York Times, another outlet guilty of the same misreporting, had acknowledged its error a week earlier. Most of the time such unprofessional reporting comes either from inaccuracies or manipulation of facts, like the BuzzFeed story about money transfers from Moscow to the Russian embassy in Washington “to finance the election campaign of 2016”. Only about 400 words into the text could readers of the original version learn that Russia held a parliamentary election in September 2016, with diplomatic facilities serving as polling stations for traveling Russians. But occasionally a bona fide piece of fake news come through, and even more occasionally someone gets punished for it. One noticeable example came again from CNN, which sacked three journalists from its investigative unit over a single-sourced story claiming that a Trump campaign adviser was under Senate investigation for meeting a Russian investor in Davos. The man in question was Anthony Scaramucci, who is now best remembered for his short and remarkably controversial 10-day tenure as the White House communications director. But in the case of the CNN story ‘the Mooch’ had the last laugh, while pro-Trump Breitbart News celebrated a victory over the TV channel, which the president routinely brands as ‘fake news’. CNN was quite muted in explaining its position over the retracted June story, which frankly was a relatively minor one, and the subsequent dismissal of the journalists behind it. Among the three was Pulitzer prize winner Eric Lichtblau and Pulitzer prize finalist Tom Frank, both hired earlier this year to beef up CNN’s investigative team. Incidentally, also in June the channel published another single-source report by-lined by Lichtblau, which claimed that ex-FBI Director James Comey was planning to testify before the Senate that Trump pressured him over a Russia probe. Comey’s appearance before lawmakers next month was yet another failed ‘gotcha moment’ in the collusion saga. The situation may be even worse when the Trump administration’s alleged Kremlin connection is not directly involved in a story, but Russia itself is put in the crosshairs. In January, Vermonters found out that their state’s electric grid was controlled by the Russkies and allegedly only one click by President Putin away from melting down. 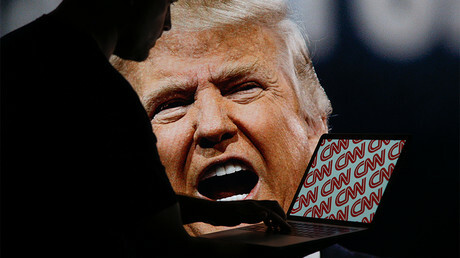 The story, reported by the Washington Post, quickly deflated into a single laptop, not connected to the grid, on which malware code had been found. US cybersecurity experts believed the code to be from the arsenal of Russian government hackers. Guess which version of the story scored more retweets. The journalistic failure was reportedly aggravated by WaPo’s initial attempts to defend their reporting. And came at a bad moment. Less than a month earlier the newspaper came under fire after covering the online campaign of a website called PropOrNot, which claimed to be tracking Russian propaganda. Critics branded the site ‘McCarthyite’ and blasted WaPo for giving it credibility. But of course the current environment in the US is not simple for Russia reporting. When the DHS cannot make up its mind on whether Russia targeted election systems in 21 US states or simply lurked in the deep, one can hardly be surprised that the media muddies the water further rather than make them clear.